Our friend Helen shares a story about bonding with her neighbors through the art of dumpling making and how God redeemed the circumstances and changed her heart when things did not go as she planned. One of my favorite facets about the role my husband Alex and I hold at our apartment complex is throwing several community events per month in order to build relationships with our neighbors and demonstrate our care for them. We had become acquainted with two particular families on separate occasions at our events over the months. We decided a month ago it was high time to have them both over for dinner. We planned to connect the families to one another since they are in similar walks of life, and have both recently immigrated here from China. Alex and I were looking forward to the evening. We prayed beforehand for the deepening of our relationships with our neighbors, and for the opportunity to share with them some amazingly good news. I was also excited because I have a certain partiality for event planning. I thought dinner with our neighbors was the perfect excuse to host a dumpling party. “Chinese people love dumplings,” Alex encouraged when I shared the idea with him. I spent much of the baby’s naptimes that week shopping and prepping for the party. We were going to have the opportunity to practice hospitality with our neighbors, and I envisioned serving familiar comfort foods. They came over that evening to two heaping bowls of homemade filling and mounds of dumpling wrappers on the table. I was feverishly wrapping dumplings while simultaneously pacifying my daughter, Serene with bits of green onion pancake. ”What are you doing?” they asked, amused. “Making dumplings,” I replied, my voice faltering. I sounded more unsure of myself than I wanted. They took one look at the store-bought dumpling wrappers and chuckled. Oh, there was so much I, in my blatant Chinese-American-ness, didn’t understand about real Chinese culture. I underestimated the legitimacy of our neighbors. Store-bought wrappers are not good, they gently explained. 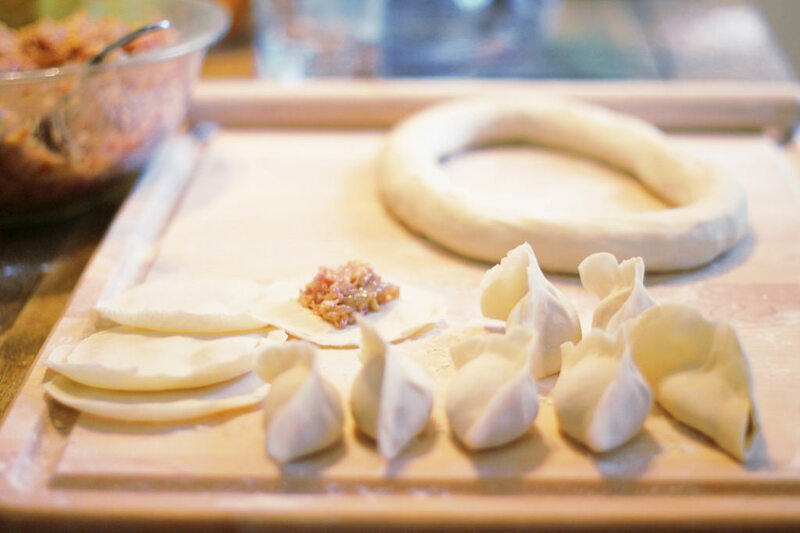 In China, everyone learns to make dumplings from scratch since they are practically babies, and dumpling wrappers are always fashioned by hand. One of our neighbors retreated to his apartment and returned with all the supplies to make dumpling wrappers. And we proceeded to make dumplings from scratch. I learned how to prepare the dough, knead it, roll it, cut it, dust each circle of dough with flour, knead each circle of dough some more into paper-thin wrappers, fill each one with just a tablespoonful of filling, pinch it tight just right, and boil them all to perfect steamy done-ness. I was in constant awe of the effort and delicacy required to craft each teeny meat-filled pocket of dough. The evening buzzed with chatter, laughter, bonding, dumpling-consuming, and most significantly, gospel sharing and discussing! It was a successful soiree; God graciously answered our prayers, and our neighbors heard the gospel. But I have to confess that in my heart of hearts, I felt dejected. If I were completely honest, I wanted them to notice my dumpling-making prowess. They caught the store-bought wrappers instead. I wanted them to behold the neat pleats in my dumpling-wrapping. They mentioned it was an “interesting” (euphemism for wrong) way to fold dumplings. I hoped they’d comment on the tastiness of the fillings. We didn’t even end up using any of the fillings I prepared because one of our neighbors brought his own to use (which was so kind of him!). Perhaps they’d even catch that I brought out pretty scalloped bowls and fancy chopsticks with which to eat. They asked for plain plates instead. I felt so badly that we invited them over for dinner, and they ended up making dinner for us instead. After our neighbors left, I even had the audacity to justify to Alex that they taught us how to make dumplings like the Northern Chinese do. And my family is from Southern China, where dumplings look and taste much different. But God taught me so much that night. He revealed the ugliness of my heart and humbled me. Alex and I prayed we’d get to know our neighbors better and share the gospel with them, but in the back of my mind, I also hoped we’d impress them with our hosting abilities. How self-centered of me to seek my own glory rather than God’s! I had the wrong perception of hospitality in my mind. Biblical hospitality is not about wowing guests with fancy spreads or pretty decor. Christian hospitality is about serving others, loving them, and making them feel welcome with the sacrificial love of Christ, all without expecting a reward. I was selfish and prideful in hoping my hospitality would be noticed and lauded, when I ought to have sought my neighbors’ interest. Which were getting to know us and one another, and understanding the gospel – all of which hold eternal significance over pretty plates and homemade dumplings. So thankful God orchestrated the evening as He did, and you can bet that after He snapped me back into my senses, we rejoiced over all that was accomplished. God is so good.